We have more than 14 years manuafcturering and designing experience. We have our own patents more than 10. We have 8 production line to keep the fast lead time. We have 8 engineer for the always technical support for you. 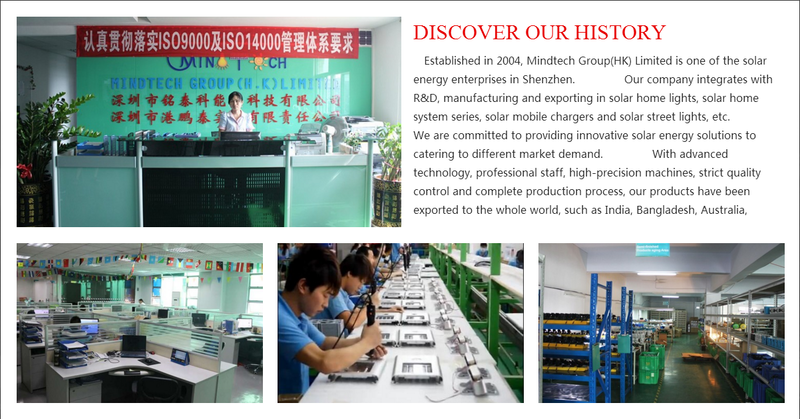 Mindtech Group (H.K) Ltd. was established in 2004. Mindtech is a high-tech enterprise engaged in researching, developing, manufacturing and selling innovative solar power products and LED lighting products. We are an authorized supplier of those world famous brands, such as the USA Lenmar and SunForce. We have obtained a good reputation from our customers in Europe, America, Africa, Asia, and Australia. Our goal is to provide clean and green solar energy products to our customers! We hope that all people can enjoy the convenience that solar products bring!